The HY-KERS fitted on the LaFerrari generates a total power of 963 HP. It consists of a V12 6.3-l aspirated combustion engine running on gasoline, able of delivering 800 HP, and of an electric part developed with Magneti Marelli, consisting of two electric engines (one main motor and one for the auxiliary systems) capable of delivering together a peak power of 120 kW (163 HP). The HY-KERS system is able to push the car to record performances and simultaneously to reduce emissions by about 40%. The two Magneti Marelli electric engines incorporated in the HY-KERS system are controlled by two associated inverters which are compact in terms of weight and size. The first engine provides drive to the vehicle and recovers kinetic energy during braking, storing such energy in the lithium batteries for the over-boost power managed in an intelligent manner by the vehicle dynamic control systems. The second engine, driven by the combustion engine, generates electricity used to keep the charge level of lithium batteries constant, in addition to provide energy for standard vehicle systems (lights, etc.). Below please find a detailed description of the main components and the operating diagram of the system. Magneti Marelli supplies technology dedicated to the LaFerrari in the Lighting area too (high-intensity Bi-Xenon headlights, LED rear lights), Powertrain (throttled body) and Electronic Systems with 10 electronic control units dedicated to controlling the vehicle standard functions, such as headlights, Superlift system, body computer, electric actuator for the intake manifolds, electronic control unit for the Dual Clutch transmission, driver and passenger carrying modules. The LaFerrari uses the Superlift system designed by Magneti Marelli which, thanks to hydraulic actuators, lifts the vehicle and helps it to easily overcome speed bumps and other irregularities in the road surface. The development of strategic components for the electric engine system fitted on the LaFerrari symbolizes, at the utmost level, the technological osmosis between the racing world and the mass-production that characterizes Magneti Marelli. Thanks to this dynamics, technologies and know-how tested in an environment featuring extreme conditions and performances are used and transferred over to mass-produced vehicles, thus ensuring great reliability, the maintenance of excellent technical characteristics in parallel with flexibility and excellent ability to adapt to the customer’s needs. In the specific case of the LaFerrari, this process has originated the development of electric moto-generators from a “racing” application already conceived from an “automotive” standpoint and not from generic industrial applications. This races-mass production technological osmosis contributes to the evolution towards new frontiers in terms of efficiency, yield, safety, lower fuel consumption and emissions, alternative engines and electronics at the service of intelligent mobility. Illuminating examples of such an exchange, with applications in both areas, can be found in both the recent past (the evolution of engine control electronics, the AMT robotized gearbox) but most importantly in a future perspective: GDI direct injection from the factory to the races, the hybrid engine systems based on KERS technologies and the possible transfers of know-how between advanced telemetry solutions for the racing world and info-telematic communication technologies between mass-produced vehicles and infrastructures. 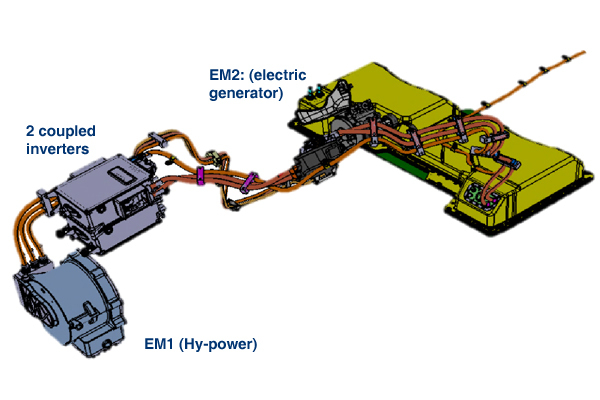 EM1: Hy-Power electric engine used for the drive or as a generator, coupled to the dual-clutch transmission (DCT). This engine recovers kinetic energy under braking (the KERS principle), converting it into electricity which is stored in the batteries, and generates additional power (over-boost) of 120 KW (about 200 torque) during the acceleration phase. The engine also ensures the deactivation of the combustion engine once the vehicle has stopped, keeping the in-vehicle electronic systems active. The Hy-Power electric engine comes from F1, and features a stator with revolutionary bar windings. Double inverter used to control the two electric engines. There are two compact-size DCDC converters inside the same box: one with voltage of 12 V, and another one that controls the battery cooling system. Battery control system consisting of a BSM (Battery Management System) and 8 BMCs (Battery Module Controllers), connected one to the other by means of two CAN lines. The control units constantly monitor the 120 battery cells. Each BMC monitors 15 cells, their balancing and temperatures. The BSM handles the control strategies of the entire package, including safety checks, such as, for example, any insulation losses.